Blossom Finance announces SmartSuku™ platform for issuing blockchain-powered Islamic financing instruments using Ethereum smart contracts. KUALA LUMPUR, Malaysia. May 7, 2018 – The darling of Islamic finance - sukuk - has thus far been limited to governments and large institutions due to the high issuing costs and complexity. But a new approach announced today by Blossom Finance aims to change that - using the blockchain. Blossom Finance’s “Smart Sukuk” platform leverages Ethereum blockchain smart contracts to increase the efficiency and reach of sukuk issuance globally. Smart Sukuk standardizes and automates much of the legal, accounting, and payment overhead of conventional sukuk offerings - all backed by fully licensed legal entities in the issuing jurisdiction. Unlike conventional bonds - which are based debt with an interest payment - a sukuk is a shariah compliant financing structure typically based on a profit sharing payment or ownership of an asset. Sukuk is securitized, meaning it is tradable on secondary markets much like a stock can be traded on a stock exchange. Islamic finance prohibits interest payments on loans and the sale of debt; sukuk markets evolved as a way to securitize Islamic modes of financing such as profit sharing. Sukuk has been a popular approach for governments seeking to finance infrastructure projects, but the legal complexity and overall cost to issue sukuk has kept it out of reach for the bulk of institutional clients. Depending on the particular needs of an institution, there are a variety of sukuk structures based on various Shariah-compliant contracts: profit sharing (sukuk al-mudaraba), deferred-delivery purchase (sukuk al-salam), lease of an asset (sukuk al-ijara), joint venture (sukuk al-musharaka), sukuk al-istisnah (project based), and cost-plus asset purchase (sukuk al-murabaha). A notable difference between bonds and sukuk can be seen in the case of default: bond holders are left with a bad debt, but sukuk holders are left with a valuable asset. 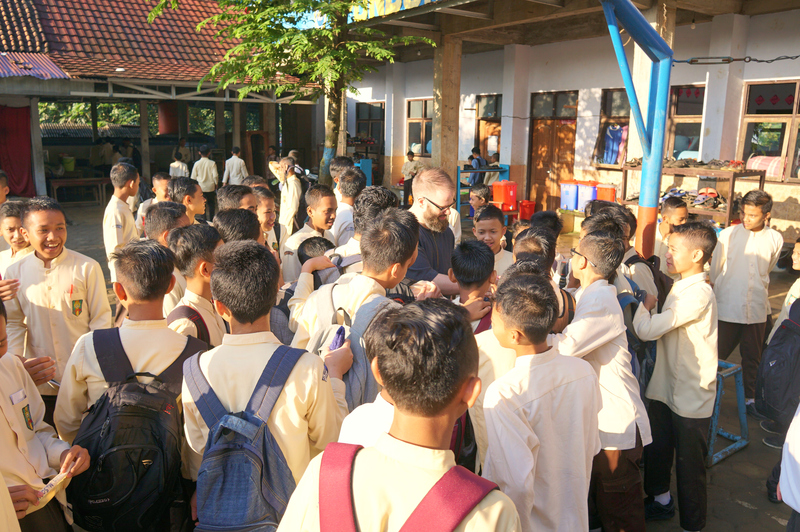 Hi-res image available hereBlossom CEO Matthew J. Martin visits a pesantren (private boarding school) in Sukoredjo, Central Java Province, Indonesia. Many community-led religious organizations fund the creation of private schools to improve access to high quality education in their community. Blossom's microfinance Smart Sukuk product will not charge any up-front fees or costs to the institutions or investors. Rather, Blossom will take a 20% share of the investor's profits - called a carried capital interest. This means that Blossom only makes money if investors make money. Regarding the pricing model, CEO Martin noted: “I'm a big believer in practicing what you preach. I can't think of a better way to align our incentives with the investors' incentives than for us to take a pure profit-sharing based commission structure. We'll stand behind each and every Smart Sukuk we issue and I feel this type of incentive model shows that's the case." "It's all about having skin in the game. The world is full of quick money bankers that simply want to transfer the risk away - and that is completely agains the spirit of Islamic finance. The excessive risk transferred garbage assets that bankers love led to the 2008 worldwide financial implosion. Sukuk is the polar opposite: it's based on assets, not debt; it involves risk participation, not risk transfer. Blossom has not yet announced a pricing model for the construction project Smart Sukuk model because, according to Martin, the specifics of each construction project will require a more case-by-case assessment. Currently, many institutions seeking to raise funds in a Shariah-compliant manner find a lack of options and these institutions find the only financing available is a conventional loan from a commercial bank. Loans with interest are prohibited in Shariah and therefore prohibited in Islamic finance. Sukuk emerged as a Shariah-compliant method for institutions to raise funds, but often has much greater legal and operational complexity than a conventional loan. Hi-res image available hereBlossom CEO Matthew J. Martin and PBMT General Manager Jamil Abbas meet with Muhammadiya Wonosobo Hospital’s Vice Director and Treasurer, Mr. Abud Ba’asir. Institutions like Muhammadiya champion numerous construction projects - such as waqaf (permanent charity) hospitals like this one - but often face a lack of Shariah compliant financing options. Investors in a sukuk are issued a share of ownership, which represents their fractional ownership in the underlying asset or structure with the terms of the sukuk ownership. Holders of sukuk receive periodic payments from the fund-raising institution. Investors can hold a sukuk until maturity, or they can sell their ownership in the sukuk to a third party. This subsequent sale to a third party is known as “secondary trading” and is what distinguishes a sukuk as a “securitized” asset. Blossom’s Smart Sukuk runs on the Ethereum blockchain, which supports “smart contracts”. A smart contract encodes business rules directly into the underlying payment currency itself – the blockchain itself enforces the contract rules regarding payments and transfer of ownership. Hi-res image available hereDiagram illustrating the maturity phase of Blossom’s Smart Sukuk for construction projects. An institution looking to raise funds can issue Blossom’s Smart Sukuk, which collects funds from investors in exchange for Smart Sukuk Tokens representing an ownership portion of the sukuk. When the institution makes payments, the funds are automatically distributed back to the Smart Sukuk Token holders via the blockchain according to the rules of the smart contract - without the need of conventional banks or intermediaries. 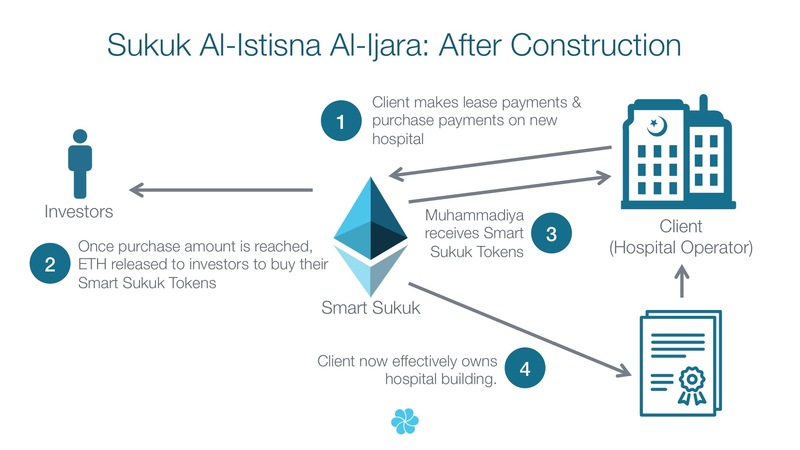 Smart Sukuk Tokens support an industry standard protocol, called ERC20. The standard allows tokens to be traded globally on a variety of public cryptocurrency exchanges. Islamic finance is bound by local rules and regulations. A recent working paper written by Mufti Muhammad Abu Bakar and published by Blossom Finance notes that cryptocurrency like Bitcoin and Ethereum is halal based on its attributes but is not permissible for use by Muslims if it’s banned by local government. Blossom’s Smart Sukuk supports issuance of the sukuk in local currency and eliminates the need for institutions to add cryptocurrency to their balance sheet. Hi-res photo hereA worker unloads fishing transport boat. 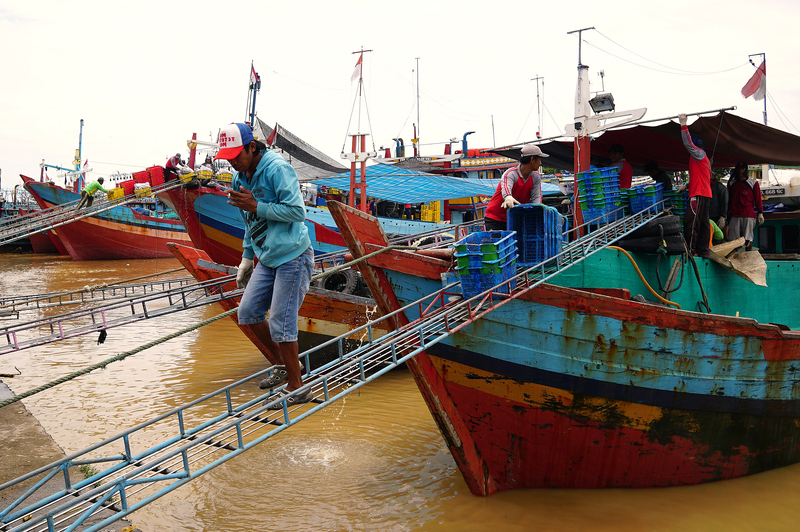 Indonesia is home to many large scale commercial fisheries that regularly seek financing to fund the purchase of boats and for repairs. Martin clarified that Blossom’s Smart Sukuk platform is neither an ICO nor will it allow ICO style fundraising. Sukuk financing generally represents fixed-length time bound investments that have a clear exit date, known as maturity. Over the term of the investment, investors receive payments based on the terms of the Sukuk, and at maturity, investors receive their principle back. A Sukuk by definition must have a clear profit generating activity, a clear exit point, and a reasonable expectation of a commercial return to the investors. Blossom Finance was founded in 2014 to increase the availability of halal financial products using technology. Since 2015, Blossom has been helping microfinance institutions in Indonesia raise funds from international investors to fund micro-businesses aimed at reducing regional poverty. Blossom’s Smart Sukuk helps institutions to raise cost-effective, Shariah-compliant financing from global investors using blockchain technology. Blossom Labs, Inc. is a US Delaware corporation. Blossom Investments are not guaranteed or insured, and investors may lose some or all of the principal invested. Blossom is not a financial advisor and statements appearing on Blossom's website and communications from Blossom do not constitute financial advice. Historical Returns are not intended as a promise of future results. Investments may have negative returns. Individual portfolio results may be impacted by, among other things, the size and diversity of the portfolio, the exposure to any single Note, Beneficiary or group of Notes or Beneficiaries, as well as macroeconomic conditions. US Residents must qualify as accredited investor under Regulation D of the Securities Act of 1933.